“Thus, and not otherwise, the world was made. Either something or nothing must depend on individual choices,” wrote apologist C.S. Lewis. For author Elma Hampton something does depend on our individual choices, and that something is a loving connection with God. 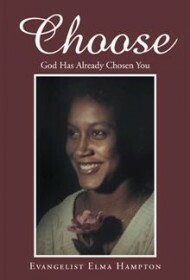 In Hampton’s book, Choose: God Has Already Chosen You, the author aims to help readers realize the importance of their decisions. In Choose, Hampton offers a series of reflections and retellings of classic Biblical stories that take us from the Garden of Eden to the teachings of Jesus, all in an effort to examine certain decisions and their consequences. Along the way, she offers commentary on the tales, as in the story of Abraham and his wife, Sarah, who conceive a child in their old age. Here the author stresses the great patriarch’s faith and the lesson for the reader: choose faith in God. Hampton’s sincerity and faith is on full display in this short work and the author looks to offer a helping hand to readers who are searching for a deeper understanding of their faith. However, the book has a number of technical problems, from awkward phrasing to misspellings to improper grammar to missing words. The result is often prose that’s challenging to untangle (for example, “Infatuation is not God, or feeling good because the minister preached a good sounding message and you jumped up off the bench, neither is it God when the organ player hits a high note. It’s that sill [sic] small quite [sic] voice that speaks to you when the storms of life is rowing.”). Such issues undermine the author’s authority and take away from Hampton’s heartfelt ideas. Ultimately, Choose needs professional editing before it can be appreciated by general readers. As it stands, the book presents a difficult reading experience overall.